It’s too often that a landlord gets hurt trying to install a store name or trying to paint at heights without using a security harness. It can be dangerous indeed to do maintenance, renovation or painting tasks at heights with a simple ladder, as there is a risk of falling. 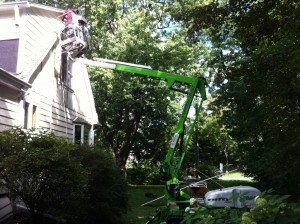 When stretching to increase his productivity, an amateur painter could have the ladder tip over and fall on his back, causing serious injuries, and sometimes also ruining the surface of the façade he is painting or repairing. Cornice painting and store name installing is safer when done with a lift where one can lay down his material (paint) and equipment (brush, tiles, wood, hammer, screwdriver, etc. ), thus allowing the work to be done more efficiently and safely. Not only is the use of the lift safer, it also permits you to be quicker in finishing the renovation job. Obviously, one who uses a ladder will have to move it each 2 meters or so while one who uses a lift could move it only about each 5 meters depending on the length of the lift. In other words, the use of a lift allows you to do your painting at heights tasks, and store name installing, and Christmas decorations installing about 3 times faster. It’s so easy to prevent work accidents. In my opinion, the use of 10-feet tall ladders should be forbidden. If you have a 2-storied house or more, it would be advantageous to rent a lift.